If you hear it a certain way, “Pray for Paris,” the hashtag of the moment, simply means let’s turn our hearts and minds to a city that has suffered a brutal and terrifying attack. Let’s allow these events and their significance to sink into us, burrow through our self-absorption and our everyday concerns, still for a moment our constant, heedless motion. I, a nonbeliever, can appreciate this sort of metaphorical prayer. If you hear it another way, “Pray for Paris” is the reflexive public expression of private beliefs, and I’ve always been tolerant of those. If someone says, “I’m praying for you,” I respond, “Thank you.” Anyone who would respond, “Well that won’t do any good!” is not, in my opinion, doing any good. And yet I become just that person when my mood shifts and I hear “Pray for Paris” in yet another way, a third way: as an answer to the question, “What should we do?” What should we do? 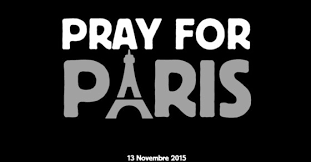 Call upon a supernatural being to help Paris heal. But that supernatural being is evidently either (a) powerless to prevent 129 people from being murdered while enjoying a lovely evening in the loveliest city in the world, in which case, what could he do now? Or he is (b) cruel enough to permit what he does have the power to prevent, in which case, why would we ask him for help? Or he is (c) nonexistent. Whichever you choose, a, b, or c, it makes the instruction to “Pray for Paris” the purest expression of futility I can imagine. And thus devastatingly apt.